- Player 1 will set up to come off the ball screen (cone) with pace. - Coach is on the strong side wing and will call out commands when player 1 comes off at the point of the screen. 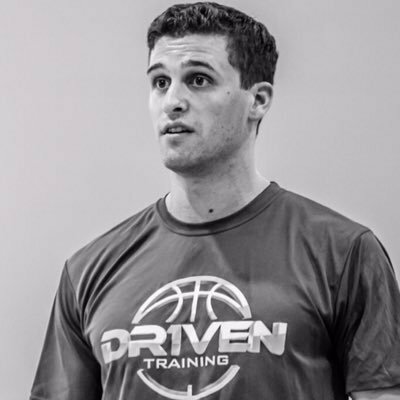 - Coach calls out an EVEN NUMBER, player will attack towards the midline into a pull up jump shot or downhill for a finish. - Coach calls out and ODD NUMBER, player will quickly get into a pull jump shot from 3. - Coach calls out a COLOR, see Frame 2 & 3. - Coach calls out a color, player 1 is working on making a hook pass (red) back to the coach on the wing. - Once the coach receives the pass, they will pass the ball right back to player 1 at the top of the key (green). - Once player 1 receives the ball back, they will bounce out on an angle to create space (blue). - Coach will sprint into an angled ball screen in the middle of the floor (red). - Player 1 will set up with pace and come off the ball screen (green). - EVEN NUMBER: Attack to a pull up jump shot or downhill for a finish. - ODD NUMBER: Quickly getting into a pull up 3.